Jackie Chan’s Asian Hawk character from Armour of God is back—sort of. He is known as a “JC” now (a heavy set of initials if ever there was), but he is in the same treasure hunting business. Such details hardly matter. 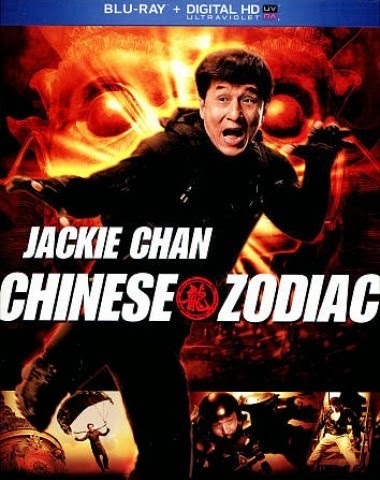 Either way it is Jackie Chan giving his all to please audiences as action star, action choreographer, co-writer, and director of Chinese Zodiac (a.k.a. CZ12, trailer here), which releases today on DVD, Blu-ray, and digital platforms from Universal Studios Home Entertainment. During the Second Opium War, the French and British largely razed the Old Summer Palace. (Time, civil wars, and the Cultural Revolution would eventually finish the job.) On that day of Imperialistic excess, twelve Chinese Zodiac statues were indeed plundered. Lost for well over a century, they have suddenly hit the market one-by-one. At least, that is the MacGuffin that swings JC/Hawk into action. The antiquities holding firm MC Corp hires JC and his team to track down the seven heads they have not yet auctioned. They are also the bad guys. No, it does not make much sense, but it gives Chan plenty of opportunity to scamper across roofs, get chased by dogs, and fight pirates. Whatever, nobody is going to watch CZ12 for the intricate plotting. The whole attraction is the acrobatic action and elaborate stunts Chan can evidently still pull off at a youthful fifty-eight years. He may have slowed down a little, considering most of the painful outtakes shown during the closing credits come from previous films, but he still looks like the real deal leaping and fighting. The opening sequence, involving JC’s getaway from a Russian military base through the use of a luge-like human roller-ball suit, might sound a little goofy, but the execution is extremely cinematic (and suddenly timely). It also memorably introduces former Chinese taekwondo champion turned actress and model Zhang Lanxin as CZ12’s secondary action figure. There is also plenty of cat burglary, a huge action spectacle involving a massive shipwreck that serves as the centerpiece, and a climatic skydiving throwdown that looks cool but ends a bit precipitously. However, the best sequence is a good, old fashioned rumble between JC and a small army of henchmen. When Jackie Chan mixes it up, CZ12 is on solid ground, even though the villains (led by Oliver Platt) are a bit weak. Since they frequently assure JC they have no intention of killing anyone, it rather minimizes the stakes (but at least as movie businessmen go, they are only mildly nefarious). Chan’s periodic soap-boxing to advocate restitution of national relics is somewhat more distractingly problematic. It all seems a little ironic considering his notorious assertion that the Chinese people are too anarchic and “need to be controlled.” In that case, would not China’s dynastic treasures be better off in a stodgy western institution, like the British Museum? Regardless of Chan’s muddled politics, he remains a ridiculously likable screen presence. He clearly wants to entertain and continues to take a fall to do so. Frankly, he is probably the one man on Earth who takes more back pills than Chevy Chase, but he still does his thing with verve. Shu Qi also looks radiant but understandably confused in her blink-and-you-missed-it cameo, while Zhang definitely earns her shot at a leading action role in the future. Recommended for Chan fans, Chinese Zodiac is now available for home viewing from Universal.